Wonderful post Joe. I’ve just been skirting the edges of Trakl’s poetry, but I think I need to plunge in, and then maybe move on to this. I love the authors views on poetry – I definitely respond to poetry and poetic prose in a subjective way and I really don’t think there can be any absolutes. This book so deeply inhabits Trakl’s poetry, that it not only offers a way to appreciate writers who have (or seem to have) had difficult lives, but also demonstrates the transformative power of literature. It is like attending a class on reading poetry by the best lecturer you can imagine, while also hearing a passionate tale of personal crisis and growth. A biography within a memoir: this sounds both disorienting and satisfying in not-so-equal measures. It seems like the kind of book that could leave one a bit stunned, unable to settle into other reading for a spell? It was, for me, a book filled with such passion, and such a unique way to approach memoir, that I left it with questions to bring into my own writing. 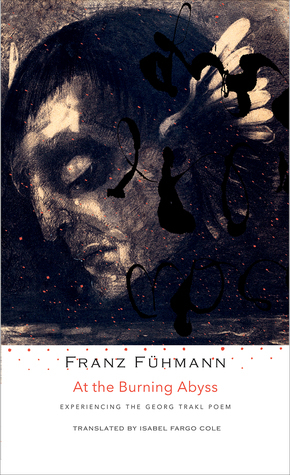 I found the biographical diversion to work because it becomes essential for Fühmann’s to address Trakl’s troubled life in basic terms to make sense of the impact the poems are having on his thinking. His passion and enthusiasm for the healing power of literature is evident and that is what you are left with in the end.